KIBBUTZ EIN SHEMER, ISRAEL — Sitting at his kitchen table in his home on a kibbutz about a one hour drive north of Tel Aviv, Donald Blair-Sanford observed how much his life has changed since he was a student-athlete at Arizona State University. A team of 25 Cronkite News reporters and three editors are in Rio de Janeiro covering the 2016 Summer Olympics. Blair-Sanford grew up in Inglewood, California, dreaming of one day competing in the Olympics. His dream has come true, but he is in Rio to run the 400 meters not in the red, white and blue of Team USA, but instead to represent his his new home, Israel. For six years, the California native has lived on Kibbutz Ein Shemer with his wife, Danielle Dekel-Sanford, a native of Israel. 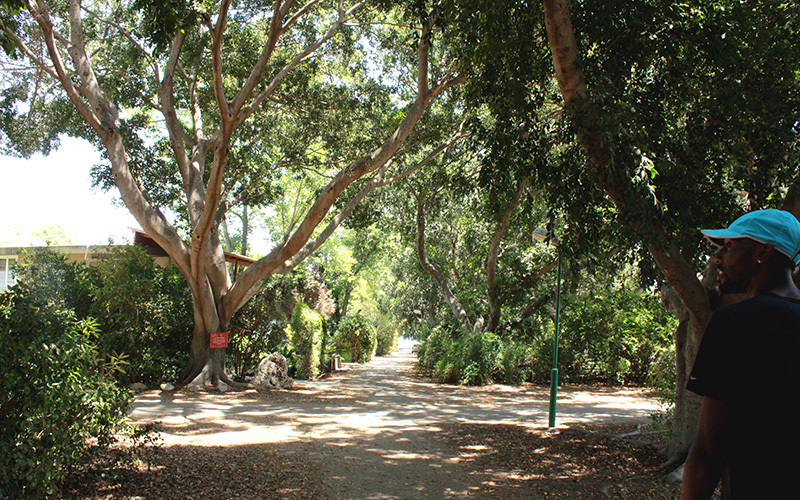 Kibbutz is is a Hebrew word that means a gathering or collection. The idea behind these communities that were first established in Israel in the early part of the 20th century is just that – people worked together without worrying about income to better the camp. All the money was put into the community and then redistributed based on different family factors. More modern ones don’t collect as much money from each person, but Blair-Sanford said people on his kibbutz seem less individualistic than in Tempe or Los Angeles. It is a long way from hanging out at Tempe Marketplace with friends or enjoying a late night Filiberto’s run. 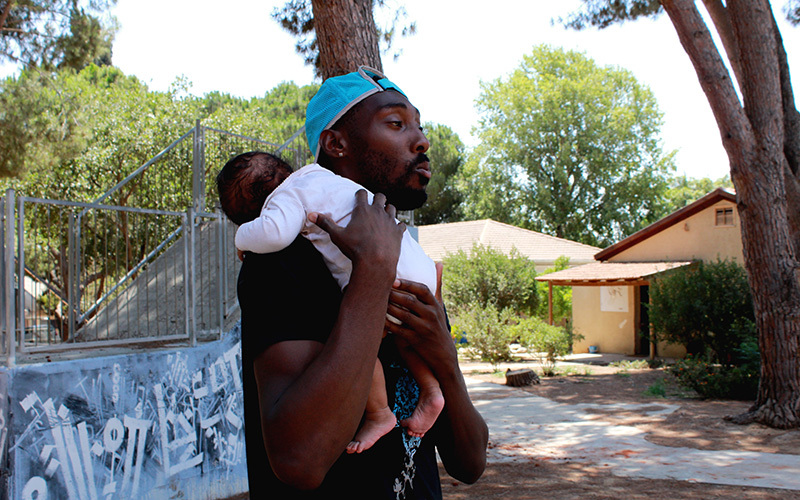 Now 28, the two-time Olympian spends his time away from training taking walks around the mile-long kibbutz with his wife, visiting the goat pens with his 4-year-old daughter and bonding with community members despite a language barrier. As he entered his house, he apologized for the mess in a home that was actually pretty clean, considering it is home to two young children. He made a cup of tea, sat down and began reminiscing about college. He actually began his collegiate career a bit south of Tempe at the University of Arizona, but because his high school, City Honors High School in Inglewood, wasn’t accredited by the NCAA Clearinghouse, he wasn’t allowed to compete on the track for the Wildcats. He transferred to a Division II school, Central Arizona College in Coolidge, in 2006 to get an associates degree and run on the school’s track team. Coolidge ended up being more than a quick pit stop along his winding college road that went from UA to Coolidge to Morgan State University before finally landing at ASU. Central Arizona College is where he met his wife. Blair-Sanford said Danielle thought he was “arrogant” at the time; she laughed when she heard him say that now. While they didn’t get off on a strong foot, the two became close when Blair-Sanford helped Danielle get through hardship. Her uncle had died in a car accident. Donald could identify. Only a year prior, Donald’s dad had died of cardiac arrest. He remembered watching the 1996 Atlanta Olympics as a nine-year-old with the man he called his “biggest supporter.” Blair-Sanford was in awe of the athletes, particularly the American sprinter with the gold cleats, Michael Johnson, who became the only male to win the 200- and 400-meter sprints in the same Olympics. He wanted to compete; more than that, though, he wanted to hold the torch, as Muhammad Ali did in opening those games in Atlanta. His mother, who had run track in high school, became his coach to help him achieve his goal. His dad never saw him run at a higher level than high school. He died on Thanksgiving Day 2004, when Blair-Sanford was just 17. By that time, the son had made a promise to his father that he would keep working hard and be the best he could. At Central Arizona, Blair-Sanford won two NJCAA Outdoor championships. At ASU, he became an All-American, and he began to realize there was a real chance that the Olympic dream he had shared with his father as they watched the 1996 Olympics together could become a reality. When he was a senior, though, Danielle’s father got sick. The two traveled to Israel so he could meet the in-laws for the first time. It was Blair-Sanford’s first trip the country that was home to his wife’s family. He knew very little about Israel. “In school we do some history stuff — we talk about the Holocaust and that type of thing. I think I heard that some guy in Israel invented the USB drive?” he said, in part looking for confirmation and in part certain he was correct. He was – while there is some controversy over the patents, both Dov Moran from Ramat Gam in Israel and Shimon Shmueli, an Israeli who lived in North Carolina at the time, patented similar pocket-sized data storage devices in 1999. On that 2010 visit, he met two members of Danielle’s family who have lived on the kibbutz for 65 years – grandma Aliza Levy, affectionately referred to as Savta, the Hebrew word for Grandma, and Aliza’s brother Shlomo. He also met Danielle’s dad, Ehud Dekel, the first Israeli athlete to compete in Israel’s highest league of sports competition, the First League, in four different sports. Noting Dekel’s declining condition, Dekel-Sanford informed her husband she would stay with her father on the kibbutz. After deliberation and long discussion, Blair-Sanford decided he would stay too. “I made the decision that I wasn’t going to leave her here and that we were going to go through it together,” Blair-Sanford said. Blair-Sanford completed his degree at ASU online and joined the Maccabi Tel Aviv club team to run track. Now, six years after arriving in the country to be with his wife’s family, Israel is now his home. He holds dual citizenship in the United States and Israel and is representing the small country in the Middle East in the Olympics for the second time. Blair-Sanford made his first Olympic team in 2012, running the 400-meter dash in London. He thought about how all of his hard work had paid off. Though he wasn’t carrying the torch like Ali, the man was achieving goals set with his father all those years ago. Blair-Sanford placed fifth in his heat. He’s worked the last four years to improve his time, but the language barrier that can come with living in a foreign country provided an extra challenge. His trainer in Israel doesn’t speak English — only Hebrew and Russian — and Blair-Sanford hasn’t had time to focus on learning Hebrew due to his intense training schedule and frequent trips to train in foreign countries that take him away from Israel for as long as six months. The two communicate almost solely through small talk and basic training terminology. With kibbutz residents, Blair-Sanford can get through the basics of the language. He made short conversation with most people he passed while walking to the cafeteria that offers lunch to community members, and it was apparent he felt comfortable and at home. The Sanfords have two children: Amerie, the four-year-old, and Rylee, who’s one and a half months old. Amerie goes to a daycare right next to the one she was at as a toddler. She’s about to start preschool with the same group of kids she’s known her entire life. There are a lot of of kids in Ein Shemer. They flooded the cafe as the Sanfords were about to walk out, and were playing on the playgrounds and soccer fields the kibbutz had to offer. 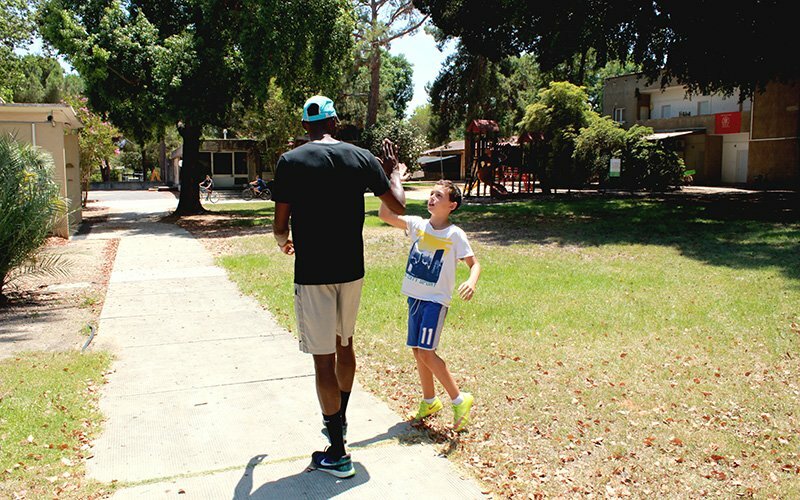 Every once in awhile, a kid would run up to Blair-Sanford; he’s somewhat of a celebrity to them. In the cafe, a pair of boys shyly asked in Hebrew if he was going to the Olympics. Later, one of the same ones ran up behind Blair-Sanford’s 6-foot-5-inch frame and stood on his tiptoes, smiling gleefully toward his friends. Another jumped up to try to touch Blair-Sanford’s head from behind. The kid almost reached the athlete’s neck. The way Amerie and and Rylee will grow up at Ein Shemer has evolved over the six decades Levy has lived there. The Egyptian native used to work with children, and in a soft voice with somewhat fractured English — one of the four languages she can speak — she described the education system. Instead, they would stay at daycare for multiple days. Nowadays, the kids are enrolled at daycares, but they live with their parents. The Sanfords walk Amerie over in the morning and pick her up at 4 p.m. The school is a two-minute walk from the Sanford’s house. It’s clear Blair-Sanford wishes he could spend more time with his older daughter instead of traveling to train so much. When she was smaller, there was a language barrier between the two, as she picked Hebrew quicker than English. “At first it was a bit difficult not being able to communicate with her,” he said. While she was immersed in a world where Hebrew was spoken all around her, Amerie’s primary English teachers were a mix of old and new – her parents and music, along with Netflix and YouTube. There’s one musician who she particularly enjoys. Amerie visited him for two weeks when he trained in London, and a visit to “Winter Wonderland” in England while there helped her learn her father’s native language a little better. He is out of town again, but this trip won’t be for half a year. He’s spending a few weeks in Rio de Janeiro. Blair-Sanford said he’s trying to stay composed and run smart in the 400-meter race, but he’s got 44 seconds on his mind. His best race is 45.04 seconds and he’s trying to join more exclusive company. Blair-Sanford walked back onto the porch of his house, mentioning that it needed to be cleaned and re-arranged. He entered his home, stocked items that would be found in many American houses – wifi, air conditioning, and the latest Xbox and PlayStation. He sat on the couch with a leg up; in a few hours, he would drive about 45 minutes to Tel Aviv, where he trains and often has to sleep in an apartment because of rigorous training schedules that often include two practices a day, sometimes in the early morning to counter Israel’s heat.